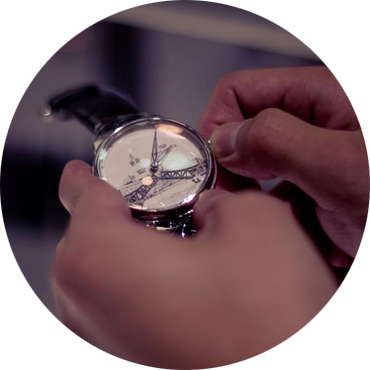 Did you know: in order to be considered Swiss Made, only 51% of the value of the movement must be Swiss. (The only other requirement is that the final part be added in Switzerland). It's not widely known that many Swiss brands use Chinese parts and assembly on a large portion of the watches they import to the United States, Europe and Asia. It's not uncommon for a single Swiss watch to have a Chinese case and crystal, a Taiwanese dial and Japanese hands. East Watch Review founder Brad Green is a watch enthusiast and full time marketing and design consultant with over 8 years of experience in China and Hong Kong. He was recently named as one of only 4 members of the China Watch Overseas Working Committee, a formally instituted working group established by the China Horologe Association, the governing body for clock and watch production in China. Contributor Ron Good is an experienced collector of both vintage and modern Chinese time-keeping devices, and curator of the Alberta Museum of Chinese Horology in Peace River. Since 2008 he has traveled extensively throughout China meeting with the industry's top tier of leadership. He is the leader of the China Watch Overseas Working Committee, and the only non-Chinese person granted an honorary membership into the China Horologe Association. You can also find Ron contributing daily as albertatime on various forums. Kalila Snow Jan is a comic geek and skater, media artist, designer, photographer, and graduate of The University of East London. Find her skating and creating on the streets of various cities worldwide.